Coconut and Angel are our beloved pets. 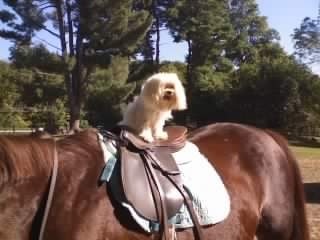 Sir Coconut of Hyde Park, is a Miniature Maltese weighing in at just under 4 lbs. He is currently one year old with his birthday on November 18th. Below he is horseback riding at the stables in Rhinebeck. He is quite the traveler and accompanies us where ever we go. He has more frequent flier miles than most puppies and he has even been to church and of course, the mall..
Angel, is a sleepy feline and has been a member of the family for 10 years. She weighs in at 20 lbs and her birthday is November 25th. Angel doesn't have the traveling experience that Coco does but she does have far more seniority in the house than he does. She spends her time sleeping in the warm sun coming in from the windows and she has never been outside for more than a minute or two her whole life. 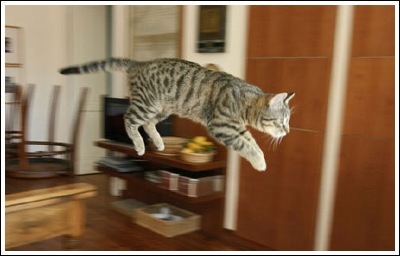 She is shown here taking her first flight when she was still a kitten. Angel doesn't fly too much lately but still limbers up her wings occasionally to keep them in tip top shape.